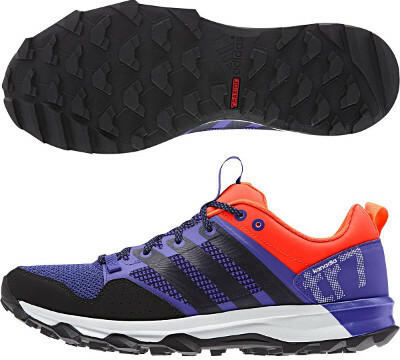 Adidas Kanadia TR 7 are neutral trail running shoes. The Adidas Kanadia TR 7 takes advantage of new edition to get rid of redundant elements (lightest Kanadia ever!) and become a plain but successful trail running shoe. Located in the entry level (low budget) segment, the Kanadia 7 targets trail beginners running on non-technical tracks. There is a complete revolution from its predecessor the Kanadia TR 6 and naming just helps users to figure out which trail running shoe category the Kanadia TR 7 belongs to. Most overlays have been removed from new air mesh upper designed for maximum breathability. Additional support is provided by engineered 3-Stripes panel. Check availability for Gore-Tex® version to protect feet under extreme weather conditions. Unsophisticated midsole is based on durable EVA providing long term cushioning for great comfort. Outsole features a new heavily lugged design (TRAXION™) for top grip regardless of the terrain. Following latest market trends, the Kanadia TR 7 is available in different bright colour schemes for those fashionable trail runners.